A change of plan last week meant that I took my godson on an epic ride (he's 11, so such things are relative) around the Shooters Hill area today in the suburbs of South East London. My ride was a restored Marin Muirwoods all terrain bike from the very early 1990s, a rigid bike with a steel frame. It's heavy, but dependable and perfect for a good yomp through the woods. Marin Muirwoods - perfect for a good yomp through the woods. 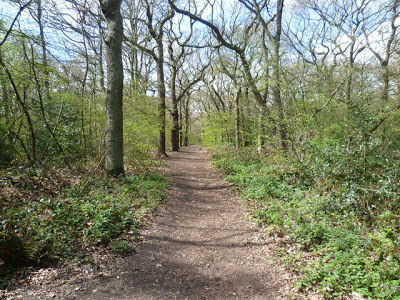 The surprisingly enjoyable sections were through Oxleas Wood where it has been raining on and off for most of the last month. So it was a bit muddy in places, with some rooty climbs and plenty of squelchy leaves, however other sections were very quick and dry. Oxleas Wood had plenty of trails ranging from wide avenues right down to narrow fox runs through the brambles. Technically, these are probably footpaths, but no one seemed to object and there were plenty of other wheel tracks dotted about. The little tyke positively threw himself along the downhill sections with outrageous tail slides, I would love to get him on a skibike, maybe in a few years time. This might be about skibikes, but I still like to keep the "bike" in skibiking very much alive. Normally this consists of many dreary commuting miles between my home in the suburbs and work based in the centre of London. Occasionally though something special happens, certainly the 1000 miles I racked up whilst working at the Olympics/Paralympics this summer will be with me to the end. I also love to get in a few true recreational rides during the year, where the only goal is to soak up the sheer visceral pleasure to be gained from consuming miles of terrain, with nothing more than the breeze and the changing scenery to fill your consciousness. For a city dweller, based in one of the most over inhabited corners of the planet, such trips are not only good for the body, but also for the soul. The weather is almost unimportant, which was just as well, as the forecast looked distinctly iffy as I left for the train station, expecting autumnal gloom at best, heavy showers and torrential downpours at worst. 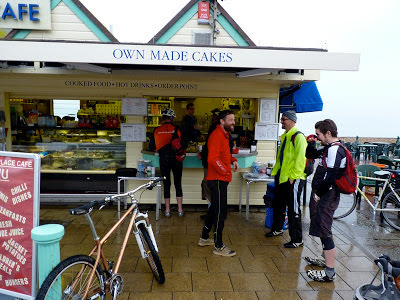 I was heading for Purley train station and the brisk 40 mile train journey to Brighton on the English South Coast to join the local RetroBike riders for the amusingly named "Tour de Cake // Concourse du Café 2012". This was to be the second time I had been on this event; a genteel ride along the promenade from Shoreham on Sea to Rottingdean and back. With much admiration of an eclectic mix of obsolete bikes and the consumption of stupid quantities of tea and cake. For my part I managed to get in plenty coffees en route, but was oddly not hungry, in spite of a missed breakfast, I seemed immune to the temptations of cake and only remembered I had two delicious Braeburn apples with me on the train journey home. My poor appetite however didn't affect the boundless energy I seemed to possess. Apparently, I am "pretty fit (for an old bloke)" and "pretty fast for someone who doesn't wear a helmet" hmmm, I think there was a compliment in there somewhere! News just in from Al Wallace who is putting a skibike together for a trip to La Plagne in February 2013. I haven't heard anyone using La Plagne for skibiking yet, but according to my records, in 2009 they confirmed that they allow SkiBikes and SnowScoots providing you wear a safety leash. The ski resort is one of the largest in the world and great for family ski holidays and group skiing holidays. The Vanoise Express cable car links the resort via les Coches and Plan Peisey in Les Arcs creating the combined ski area, Paradiski. La Plagne itself is well known as a beginners’ and intermediates’ paradise. 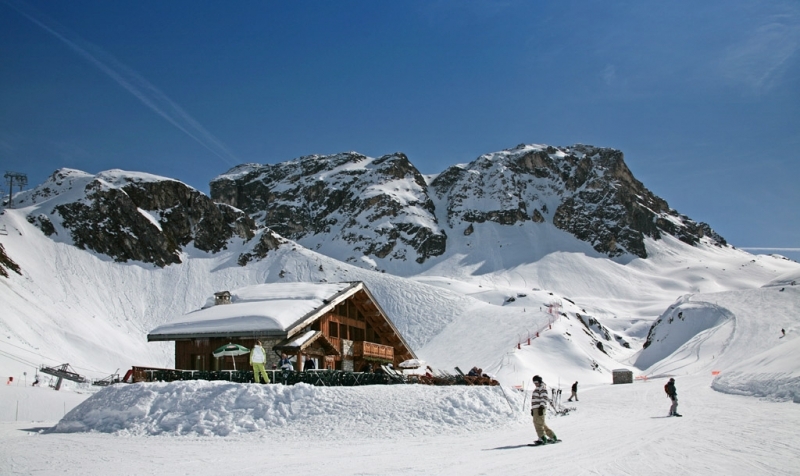 There is a huge number of easily accessible nursery slopes and miles of motorway pistes. The whole ski area is served by a massive inter-linking lift system. A network of snow-making machines covers many of the lower slopes as well as some higher altitude pistes. Good luck Al, and don't forget the new moto for this blog "imagines aut nunquam accidit" - pics or it never happened! Anyone who has waited for a bus knows the routine: you wait far longer than you should, then three come along at once, this seems to be the case with the current crop of classic Porsche skibobs coming up for sale. Noel, from Pennsylvania USA, is the latest person trying to find a new home for a Porsche 212. The current tally is 3 people with no fewer than 4 Porsche 212 ski bobs to sell between them. They are located in California, Pennsylvania and Ohio respectively. Skibiker Duane Mullins, suggested another interesting alternative use for one of these collectibles; by using the body as a beer cooler. Lastly, if you need to contact me, please make sure to include your e-mail address in the body of your message.